A good diet is the best way to get nutrients, but sometimes you can’t get enough through food. Many of us have a daily regimen of vitamins and mineral supplements, often because we’ve read how a certain vitamin, for example, can boost our immune system. Yet studies have shown that eating the right diet is more beneficial than taking a supplement. Many foods also have fiber and other substances that provide health benefits. In addition, you may be wasting your money on expensive supplements that are not helping you, may interfere with prescribed medication therapies or could be harmful because certain supplements can be dangerous in large doses. However, some people, such as strict vegetarians and vegans, may never be able to get enough of certain vitamins, such as vitamin B, in their diets. As we get older, we need to ensure that we are getting adequate nutrients, and diet alone may not be enough. Older adults might need supplements because our bodies become less able to absorb key nutrients. Some seniors cook less (or never learned how, in the case of widowers), plus we lose our sense of taste, or some foods become difficult to chew or digest. So we don’t eat as much. For older adults, several vitamins and minerals are essential, whether you get them from your diet or from supplements. Check with your healthcare practitioner to know which ones are right for you. Vitamin B12 is important for creating red blood cells and DNA, and for maintaining healthy nerve function. Older adults can’t absorb it from food as well as younger people. In addition, commonly prescribed heartburn drugs, such as proton-pump inhibitors (for example, brand names Nexium or Prilosec), reduce acid production in the stomach, and acid is needed to absorb vitamin B12. Vegetarians or vegans will not get enough B12 in their diet because it’s present only in animal products. Stomach stapling or other forms of weight-loss surgery interfere with the body’s ability to extract vitamin B12 from food. Although many claims have been made that vitamin B12 prevents Alzheimer’s disease, heart disease and other chronic conditions, there is no evidence of this. The National Academy of Sciences (NAS) recommends you get 2.4 micrograms (mcg) of vitamin B12 every day. You’ll find this vitamin in fortified cereals, meat, fish, poultry, eggs and milk. Another B vitamin, B6, helps form red blood cells. NAS recommends 1.7 milligrams (mg) every day for men and 1.5 mg for women. You can get vitamin B6 from potatoes, bananas, fortified cereals, whole grains, organ meats (like liver) and fortified soy-based meat substitutes. Too little folic acid/folate leads to anemia. NAS recommends 400 mcg each day for both men and women. You can get this essential B vitamin from dark-green leafy vegetables (like spinach), beans, peas, and oranges and orange juice. Also, many breakfast cereals are fortified with folate. Because it is mainly produced by sunlight, vitamin D is generally deficient in those who do not get outside. As we get older, we may spend more time indoors, especially in inclement weather, and our skin is less able to synthesize vitamin D. This vitamin helps the body absorb calcium, maintain bone density and prevent osteoporosis, and may also protect against some chronic diseases, including cancer, Type 1 diabetes, rheumatoid arthritis, multiple sclerosis and autoimmune diseases. In older people, vitamin D deficiency has also been linked to an increased risk of falling. The NAS recommends at least 600 international units (IU) for people age 50-70 and 800 IU for those 70 and above. However, you should never take more than 4,000 IU. You can get vitamin D from fatty fish (such as salmon or tuna), fish liver oils, eggs, fortified milk and milk products, and fortified cereals. This mineral, which carries a slight electrical charge, is helpful with nerve impulses and is needed for all sorts of functions, including keeping your heart beating and your muscles working. 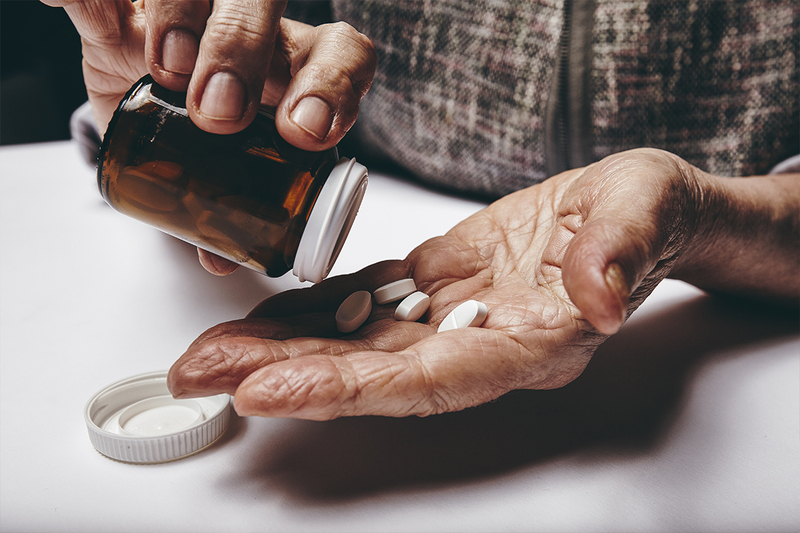 Seniors who are taking diuretics, also called water pills, to control hypertension and congestive heart failure may lose too much potassium as they urinate. Too little potassium, which is an electrolyte, can result over time in fatigue, weakness of the muscles, headaches and changes in bowel habit. The daily recommended dosage is 4,700 mg, although many older Americans don’t get enough potassium, according to surveys. You can find potassium mainly in fruits and vegetables, particularly bananas, prunes, plums and potatoes with their skin. Too much potassium also can be dangerous, so consult with your health care provider to be sure potassium levels are neither too high nor too low when taking diuretics. As we age, we are less able to absorb magnesium, which can help prevent heart disease, diabetes and certain cancers, as well as osteoporosis. Some medications, such as diuretics, may also reduce magnesium absorption. The recommended daily dosage for women over 30 is 320 mg, and for men is 420 mg, but too much magnesium can be toxic. Good sources of magnesium are fresh fruits, vegetables, nuts, whole grains, beans and seeds. Because calcium is so important for building and maintaining strong bones, it’s crucial that older adults get enough of this mineral. Too little will increase the risk of brittle bones and fractures. Post-menopausal women, especially, lose the ability to absorb calcium. The National Institutes of Health (NIH) recommend 1,000 mg for men 51-70 years of age and 1,200 mg for women. Both sexes over 70 should take 1,200 mg, but not more than 2,000 mg a day. There are several types of calcium supplements. Calcium citrate and calcium carbonate tend to be the least expensive. Calcium-rich food sources include milk and milk products, some forms of tofu, dark-green leafy vegetables (like collard greens and kale), broccoli, soybeans, canned sardines and salmon with bones, and calcium-fortified foods. Two other supplements get mixed reviews. Consumer Lab tested 38 multivitamins and found defects in one-third of them (“Defects Found in 33% of Multis Put to the Test,” July 27, 2016). Results showed 14 multivitamins contained either too little (as low as 8 percent) or too much (as high as 226 percent) of claimed amounts of vitamin A, vitamin C, folate or calcium. A range of multivitamins contained more than the upper tolerable limits of niacin, vitamin A, folate and magnesium. Interestingly, the test found that some of the best vitamins were also the cheapest. The more expensive products weren’t any better than those that cost less. The problem is that the government does not regulate supplements, as it does medicine, to make sure they are safe or effective, because the U.S. Food and Drug Administration (FDA) labels supplements as food, not medicine. So, just because you see a dietary supplement on a store shelf does not mean it is safe, that it does what the label says it will or that it contains what the label says it contains. The FDA only gets involved when it receives complaints about a product. Larger pharmacies, where product turnover is high, may be preferable over smaller pharmacies, because medications have an optimal period of time before losing their potency. In any case, make sure to check expiration dates before purchasing. A few private groups, such as the U.S. Pharmacopeia (USP), NSF International, ConsumerLab.com and the Natural Products Association, have their own seals of approval for dietary supplements. To get such a seal, products must be made by following good manufacturing procedures, must contain what is listed on the label and must not have harmful levels of ingredients that don’t belong there, like lead. To be sure that the supplement you are buying is safe, check for the seals on the product. Or you can go to the NSF’s website to the see the list of supplements certified by the organization. While there is not sufficient evidence to support a recommendation for or against the use of multivitamin and mineral supplements, taking a daily multivitamin can help some people get the recommended amounts of vitamins and minerals, especially in situations when they cannot or do not obtain them from food alone. But taking a multivitamin can also raise the chances of getting too much of some nutrients, like iron, vitamin A, zinc, niacin and folic acid, especially when a person takes more than a basic, once-daily product that provides 100 percent of the daily value of nutrients. Keep in mind that there is no standard or regulatory definition for multivitamins—or any dietary supplement. No agency regulates which nutrients they must contain or at what levels. (See sidebar, “Are Supplements Safe?”) Manufacturers choose which vitamins, minerals and other ingredients, as well as the amounts, to include in their products. If you decide to take a multivitamin, read the label to make sure you are getting the vitamins and minerals you need and in the right dosages for your age. Avoid supplements with mega-doses. While some research suggests that a diet high in omega-3 fatty acids can protect brain health, a large clinical trial by researchers at NIH found that omega-3 supplements did not slow cognitive decline in older persons. However, these unsaturated fats have been shown to reduce symptoms in rheumatoid arthritis and slow the progression of age-related macular degeneration. Instead of taking supplements, eat at least two servings of fish a week, especially salmon, tuna, sardines and mackerel. Omega-3 vegetable sources include soybeans, walnuts, flaxseed and canola oil. When using supplements, remember to keep them away from heat, which breaks down their effectiveness. This is especially relevant when taking a car trip and you’ve stashed your vitamins in the car. Similarly, medications should not be stored above the stove. “Dietary Supplements,” National Institute on Aging. “Vitamins and Minerals,” National Institute on Aging. “Vitamin B12 deficiency can be sneaky, harmful,” Harvard Health Blog. “Supplement Pills That Promise Too Much,” June 2016, AARP Bulletin. “The Best Vitamins and Minerals for Seniors,” May 25, 2013, U.S. News. “Older Adults: 9 Nutrients You May Be Missing,” WebMD. “Many multivitamins don't have nutrients claimed in label,” June 20, 2011, NBC News. “NIH study shows no benefit of omega-3 or other nutritional supplements for cognitive decline,” Aug. 25, 2015, National Institutes of Health. “Vitamins and Minerals,” National Center for Complementary and Integrative Health.